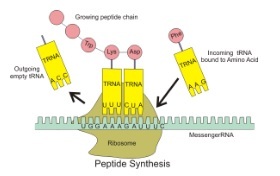 This process continues until the ribosome reaches a ‘stop’ codon (triplet) on the mRNA. At this point, the polypeptide breaks loose from the ribosome and is free. Several different triplets can code for the same amino acid. For example, CGG and CGU both code for Arginine. This property of DNA is called degeneracy and DNA is known to be degenerate. It means that for instance, if there was an error in copying the CGU triplet and CGG was copied instead, there would actually be no difference in the primary structure of the polypeptide.